I’ve talked about this before – whether your jewelry design is intricate and complex or minimalist simple, color can take your design from “nice” to “fabulous”. My personal preference is for earrings that have a lot of presence but are not super heavy (I’m all about the comfort thing). These rhinestone combinations fit that bill nicely – multi stone settings for round stones combined with teardrop settings. And you have so many color choices! 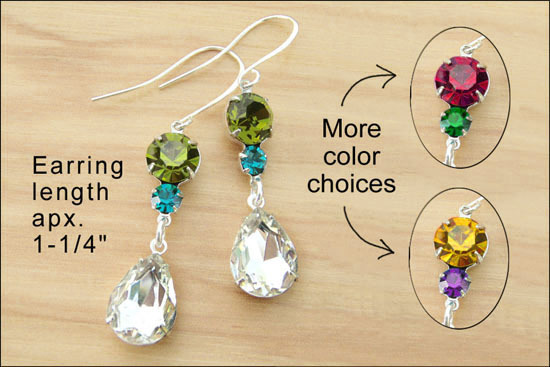 In the pic, you can see crystal teardrops with olivine and blue zircon rhinestones, crystal with ruby and emerald glass, and crystal with golden topaz and amethyst glass. 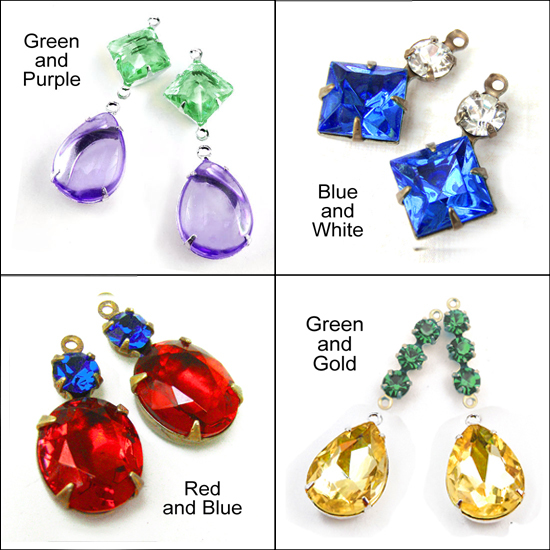 And these are only a few of the possible combinations – you can match your Christmas outfit, or your wedding colors…. or hey, your pajamas, if you want! 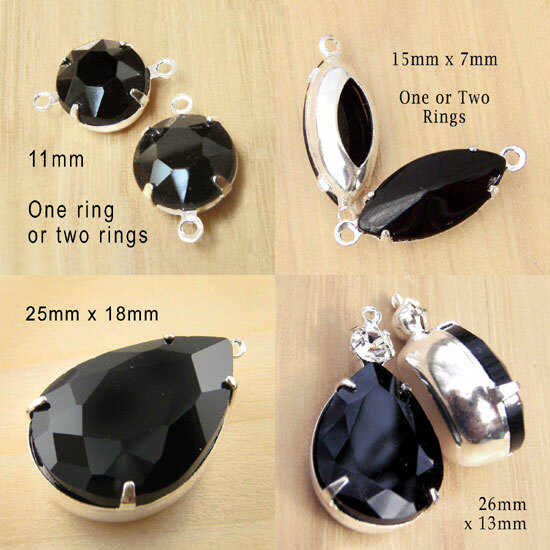 Obsidian, black onyx, jet – these are all popular names for genuine, semi-precious black jewels and stones. They’re also descriptions that are often used when referring to black glass. Well I don’t see any need to use confusing “gemstone” titles. I love opaque black glass. Honest, easy to use, always classic. You can’t go wrong, and you don’t need to dress it up with fancy (fake-ish) names. See what I mean? These gorgeous glass stones can easily be used to make gorgeous earrings, necklaces, bracelet links…. with emphasis on “easily”. Not to mention they aren’t costly. With fall coming, black is going to be a basic. Well. Let me rephrase that. Black is always a basic, always classic, always looks good. With school starting up, this is a great way to make some money at local craft shows. Make some earrings (or whatever floats your boat) in your team colors. I’m not suggesting infringing on any trademarks…. just that, if your son’s high school football team colors are blue and gold, well, it couldn’t hurt to offer some jewelry in those colors, when you’re selling at the local fundraiser. No reason you can’t try a few ideas along those lines, yknow? No copyright infringement, please. Don’t claim that you’re offering official North Kansas City Hornets jewelry – you’re just selling earrings made with purple and gold. Other teams – say, the Dallas Cowboys – might get a little touchy if you say you’re selling their licensed jewelry – without the license. But selling earrings made in montana sapphire (navy blue) and white (crystal) – well those are just going to be pretty. And they certainly don’t need to be licensed. You see what I mean. It be a great way for your neighbors to learn about your jewelry biz – and a cool way to raise money for the football team!